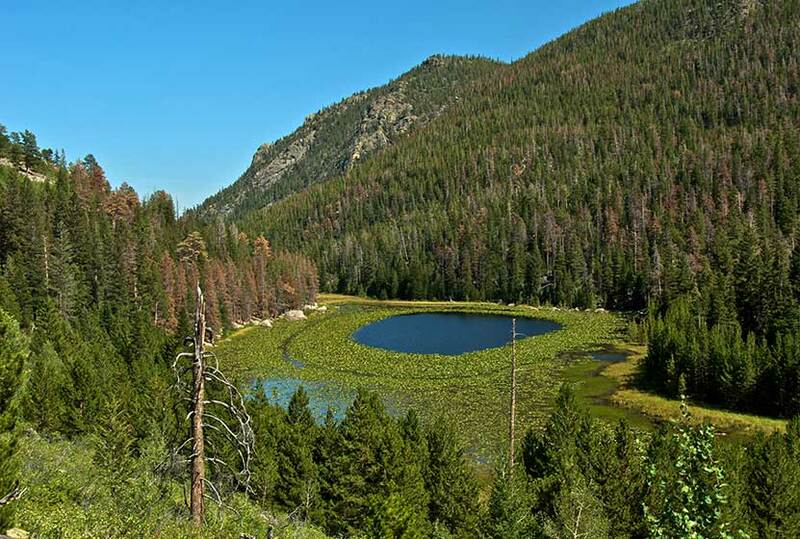 Cub Lake, in Rocky Mountain National Park, is known for its unusual halo of lily pads. The 4.6 mile, roundtrip hike dazzles with its variety – especially the wildflowers. You’ll pass through wetlands, glacial formations, and meadows before arriving at the lake. 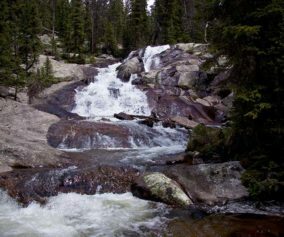 Explore the full Cub Lake hike profile below for trail map, driving directions, and all the details you need to enjoy this adventure in Rocky Mountain National Park. The Cub Lake Trailhead in Rocky Mountain National Park has a very small parking area where only 7 to 8 vehicles can park. Chances are, if you don’t arrive early in the morning, you’ll need to park just .3 mile further down the road at the Fern Lake Bus Stop parking area. If both lots are full, then your best bet is to park in the RMNP Park & Ride lot and use the shuttle service to get to the Cub Lake Trailhead. Please do not park alongside the road. This causes significant erosion and damage to roadside–and you might get a ticket. 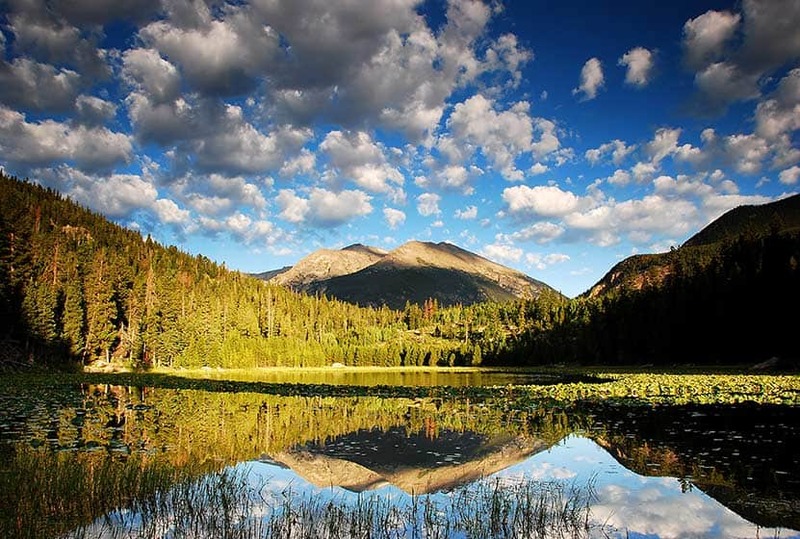 One of the things we love about Rocky Mountain National Park is the diversity of landscapes. 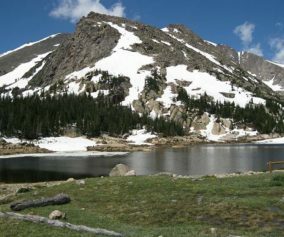 The Cub Lake trail is a great example. Over the course of the 2.3 mile journey to the lake, you’ll encounter plenty of sights that you will want to take in. The trail begins in the wetland meadows of Moraine Park, replete with willows and other wetland shrubs. It’s a perfect habitat for a variety of birds, including western tanagers and warblers. 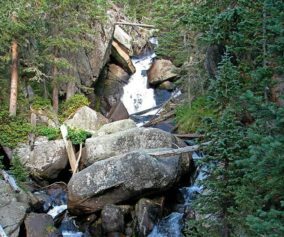 The trail crosses several bridges, including one over the Big Thompson River, (just a mountain stream at this point) then begins a climb into stands of evergreens, and then into an unusual area scraped by an ancient glacier, riddled with unusual boulders and rock. Leaving this strange landscape, the trail goes down to another meadow area and meets up with the horse trail that runs along the southern border of Moraine Park. The local YMCA offers horseback rides along this area, so keep your eyes out for horses. At this trail junction, the trail that leads up to Cub Lake is the one to the right. 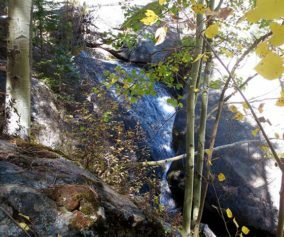 Soon, the trail goes from easy to quite demanding, working its way up a series of switchbacks before reaching Cub Lake. Two things will catch your eye at Cub Lake. First is the strange halo formation made by the yellow pond lilies that grow around the inside of the lake. The middle of the lake, open to reflect the sky, looks like a big, blue eye staring into the heavens. The second thing you may notice is a large stand of dead trees from a forest fire in the 1970s. TIP: It is advisable to arrive early as parking is limited. One may opt to ride a shuttle that drops you off at the trailhead. Photo: We would like to express our gratitude to Jeff Livingston for sharing such an amazing photograph of this hike to Cub Lake in RMNP.